We’ve enhanced our master/detail functionality that allows embedding UI elements in grid rows. 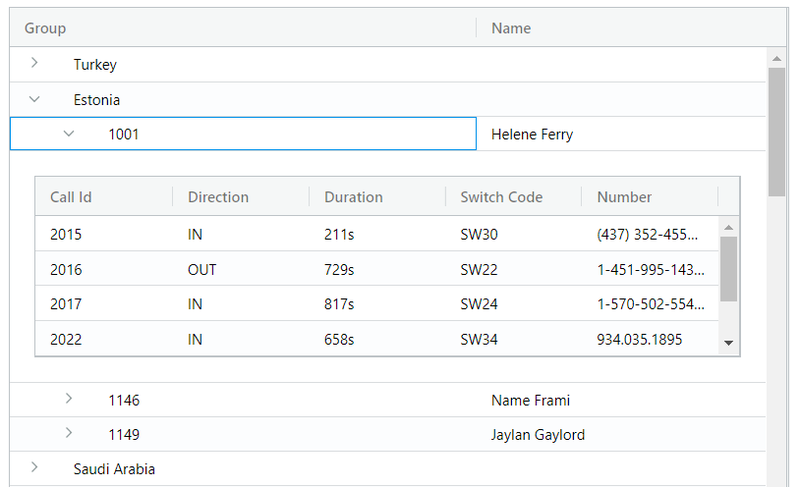 You can now combine it with server-side row model functionality that makes it possible to feed data into the grid in batches. We also made performance and UI improvements to the functionality of column/row pinning and export to Excel. We also continue working on frameworks integrations. In this release, we focused our efforts on integration with VueJS. Our goal is to make the integration with VueJS more idiomatic to users of the framework. As part of the changes we enabled typescript bindings in templates, introduced a simpler way to declare components and provide column definitions in a declarative way in templates. Also, every feature in the docs now has a VueJS example. On the picture above you can see the second row called “master row” being expanded. In the corresponding detail row, it contains an embedded grid. Typically the grid in detail row gives more information about the row in the master grid that was expanded to reveal the detail grid. What’s even more fascinating is that you can combine master/detail with row grouping and it will work seamlessly even with server-side row model! Pinning is a powerful feature in ag-Grid. Pinned columns and rows appear either above or below the normal rows of a table. Pinned columns are not affected by the horizontal scrolling and pinned rows are not affected by vertical scrolling. They always stay visible. In this release, this has been fixed. All sections are now placed in the one container, so scrolling vertically scrolls all areas at the same time with no lag. Works like a charm. As part of this release, we also updated our theming options. It’s possible now to configure color for the disabled field through SASS variable $input-disabled-background-color. 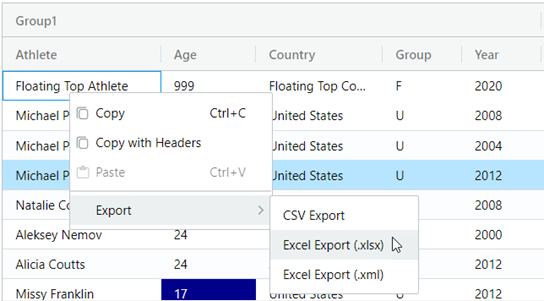 Excel Export allows exporting ag-Grid data to Excel using Open XML format (xlsx) or Excel’s own XML format. This is a very powerful feature as in the exported file it preserves styling such as column width, colors, fonts, borders etc. But at the same time, this makes the exporting process quite sophisticated and as a result, time-consuming. Previously, exporting large amounts of data, say 50000, would take a considerable amount of time and could even crash a browser. With the improvements we did in this release, it takes a few seconds to export that amount of records without crashes. And we now also support all versions of Excel, not just 2016 and newer. The focus of this release in terms of frameworks integrations has been VueJS. 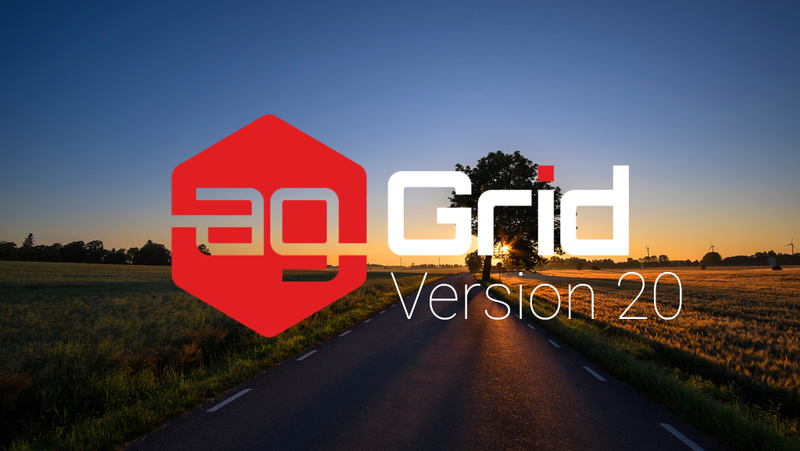 Here are a few things we’ve done to make usage of ag-Grid with VueJS more idiomatic to the users of the framework. and then specify the component in the frameworkComponents. This option has long existed for other frameworks and finally, we enabled it for our VueJS users. Starting from this release, you can bind row data using v-model. The usual way would be to use the binding :rowData="rowData", but the advantage of using v-model is that it facilitates unidirectional data flow. The main difference over normal binding is that any data changes will emit an data-model-changed event which will have the current row data as a parameter. If you do this then the grid will automatically refresh the component, updating the supplied params of the component. You can read more about all these features in the documentation.